As mentioned in the previous article, the past two years have brought significant challenges throughout much of our planting window. In many years, growers can simply wait for ideal planting conditions to arrive, depending on their cotton acreage and range that they need to plant. In addition to achieving acceptable stands, growers should try to plant when they are likely to also achieve high seedling vigor (rapid seedling emergence and rapid/robust seedling growth). This is especially important in avoiding herbicide injury (Warrant for example) and mitigating injury from thrips. However, we can only wait so long, and ultimately we reach a point in time where planting must proceed in order to meet insurance cutoff dates. The past two years have been a testament to this, where less-than-ideal conditions prevailed throughout the majority of our planting window. This article addresses some planting strategies that are sound practices in general, with emphasis on how to minimize risks of poor stands when we are forced to plant when ideal conditions do not arrive in time. As discussed in the previous article, the planting advice we provide in the Planting Conditions reports are based on long-term data for NC where conditions are rated as excellent, very good, good, adequate, marginal, or very poor. When possible, growers should avoid planting when conditions are less than “good”, but if you have to, use special care (tips below) when planting into adequate or marginal conditions. Growers should not plant when conditions are “very poor”. The rating chart in the previous article is based on the data illustrated in the chart below. 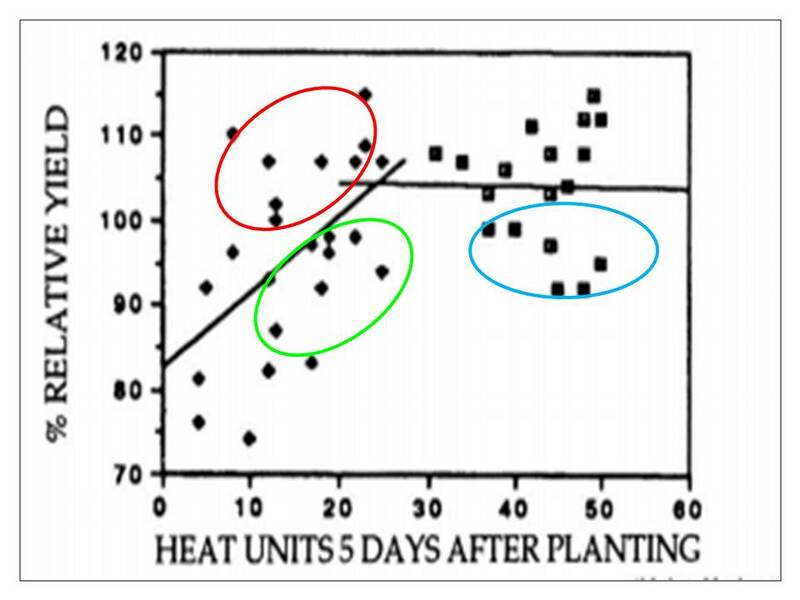 This chart illustrates that optimal relative yield is achieved when heat unit accumulation within the first 5 days following planting is greater than 25. If growers are forced to plant when predicted heat unit accumulation is “adequate” or “marginal” the tips below can increase the chances of successful planting and achieving optimal yields (red circle) while offsetting the likelihood of poor stands and suboptimal yields (green circle). 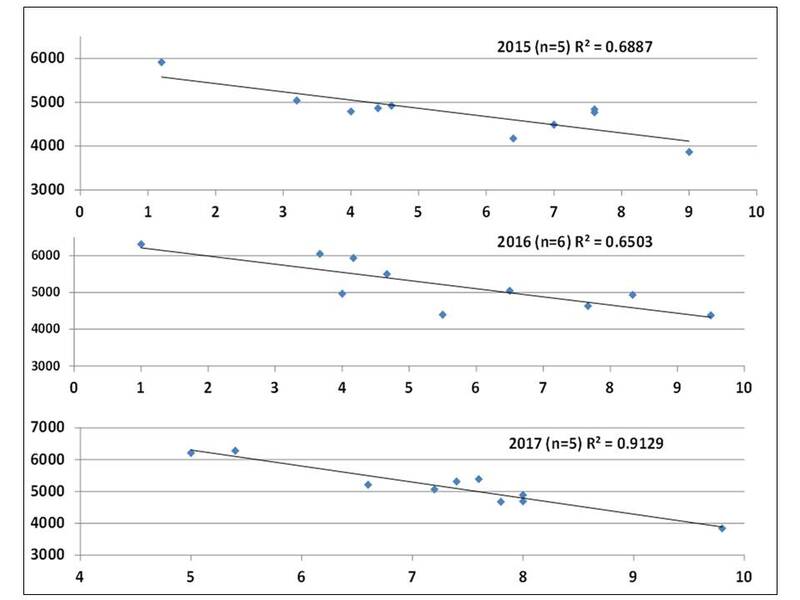 Also, as mentioned in the previous article, heavy rains within a few days of planting can adversely affect stand establishment regardless of heat unit accumulation, and yields can be negatively influenced by weather later in the year, unrelated to planting success (blue circle). Dr. Edmisten addressed many of these points throughout the winter meetings and much of this information has appeared in previous years’ newsletters. All of it is important, especially if we have another challenging spring. With regard to seed, document everything and know exactly what you purchased, well before planting begins. This is a good practice in general, but is commonly overlooked. Growers should document every lot number of seed they purchases, along with the seed treatment (list all products included in seed treatment) and whether seed was treated upstream or downstream, warm and cool germination percentages (contact your dealer or seed company rep for cool germ values), and seed size (seed per lb) which is either explicitly printed on the bag or can be calculated by dividing the number of seed in a bag by the bag weight. The lot number and seed treatment code are printed on each bag and are a record that can be traced in case you have questions later or encounter problems with emergence. You must take extra effort to secure cool germ values. Knowing seed size (seed/lb), along with warm and cool germ values, is a good indicator of likely seedling vigor relative to other varieties. Lastly, we strongly encourage all growers to save a small sample (Ziploc bag full) of seed from each they purchased, in case problems occur during planting, so that seed can be re-evaluated for various factors. Save each sample in a cool, dry place at least until an acceptable stand is achieved. Manage planting according to seedling vigor. Vigor is the product of warm and cool germ percentages, but is also closely related to seed size. 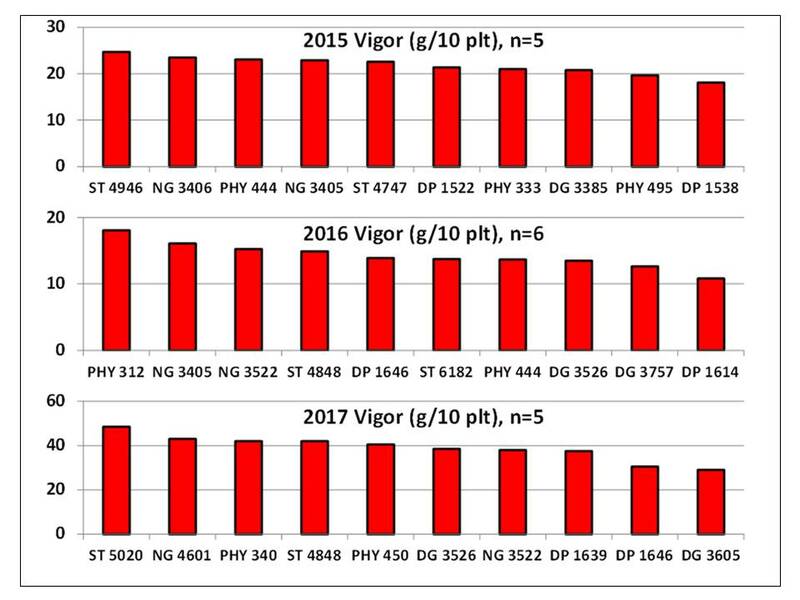 During periods of challenging planting conditions, larger seeded varieties (4500 seed per lb or less) with higher cool germ values increase the chances of successful stand establishment than smaller seeded varieties (5000 seed per lb or greater) with lower cool germ values. In very poor conditions, all seed sizes will likely experience challenges and result in poor emergence. In great conditions, like we observed in 2015, all seed sizes can achieve an optimal stands and ideal early season growth. But in adequate or marginal conditions (less than ideal, but not terribly poor), seed size and warm/cool germ values can mean the difference in achieving an optimal stand or not, depending on how deep your seed are planted. Lets be clear…..unless you have fields that present significant challenges with stand establishment in every year or most years (severe crusting, seedling disease), you probably would want to make your variety decisions based on performance (yield potential and stability, fiber quality, trait packages, etc.). In other words, match the variety to the field based on variety performance for that environment, but if a small-seed variety is the best performer in a particular field, plant other fields first where a larger seeded variety may be best suited from a yield potential standpoint. Vigor and seed size are important to consider during planting and your management practices and planter depth may need to be adjusted depending on your soils and prevailing conditions. The first figure below illustrates the vigor ranking of all varieties in the 2015-2017 NC On-Farm Cotton Variety Evaluation Program. The results from each year are not meant to be compared across years, due to vastly difference conditions between those years. However, the comparison of varieties within each of the two years may give you some idea as to which varieties may be more vigorous than others (smaller seeded varieties may need to be planted shallower and in better conditions than larger seeded varieties, depending on environmental conditions). The second figure below shows the correlation between seed size (seed/lb) and vigor ranking of each of the varieties in each year separately. This figure shows that roughly 65-91 percent of seedling vigor ranking (how one variety compares to another in terms of vigor) is related to seed size (seeds per lb). Again, it would be important for you to document seed size as printed on the bag for YOUR lot number, and compare that to other varieties you purchase, as well as warm and cool germ values, all of which can vary across lot numbers. 3. Plant shallow (this is the primary purpose of this article) when forced to plant in less-than-ideal conditions. Cotton should generally be planted 0.5 to 0.7 inches deep is most situations. In periods of cool weather, we can maybe plant shallower than this (0.25 to 0.5 inches deep). Good soil/seed contact is essential, so plant as shallow as you can while still covering seed with soil. Planting deeper than 0.7 inches will prolong the time needed for seedlings to emerge which only serves as an added stress on seedlings that we do not need right now. Additionally, planting deep in marginal conditions could cause seed’s energy to expire before fully emerging, resulting in poor stands. Most growers have a rough estimate of planting depth and rather change the planting depth. Accurately measuring planting depth (distance between the top of the seed and the top of soil directly above it) and making adjustments can have a significant impact on successful stand establishment. A trial investigating seed size and planting depth was planted at Rocky Mount on May 1st, 2017. This trial experienced decent temperatures for the first 2 to 3 days after planting, followed by a cold wet weekend with very low nighttime temperatures. Emergence was first noticed exactly a week later, which is only mildly slower than normal (ideally, noticeable cracking or emergence would be noticed in 4-5 days after planting). The photos below illustrate that both vigor and planting depth are important in achieving optimal stands, especially when less-than-ideal conditions occur. There was variation across the trial, therefore, scenarios for decent emergence and marginal emergence are both illustrated. In both cases, deep planting (approximately 1 inch) resulted in suboptimal emergence for both large and small-seeded varieties, however the larger-seeded variety was either emerged or cracking noticeably better than the small-seeded variety. 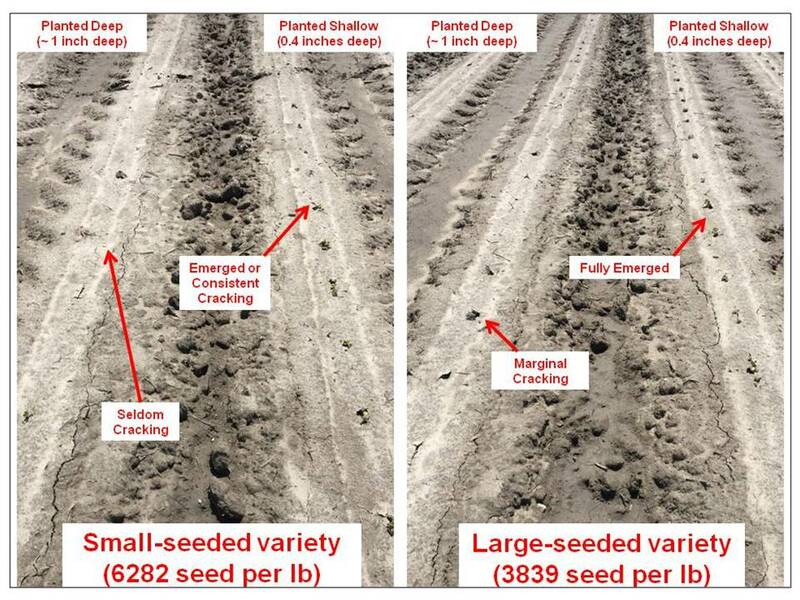 This illustrates that smaller-seeded varieties may be more sensitive to deep planting, however planting shallow (approximately 0.4 inches deep) resulted in acceptable stands for both large and small-seeded varieties. Figure 1. The effect of deep versus shallow planting for both large and small-seeded varieties where decent emergence occurred. Figure 2. 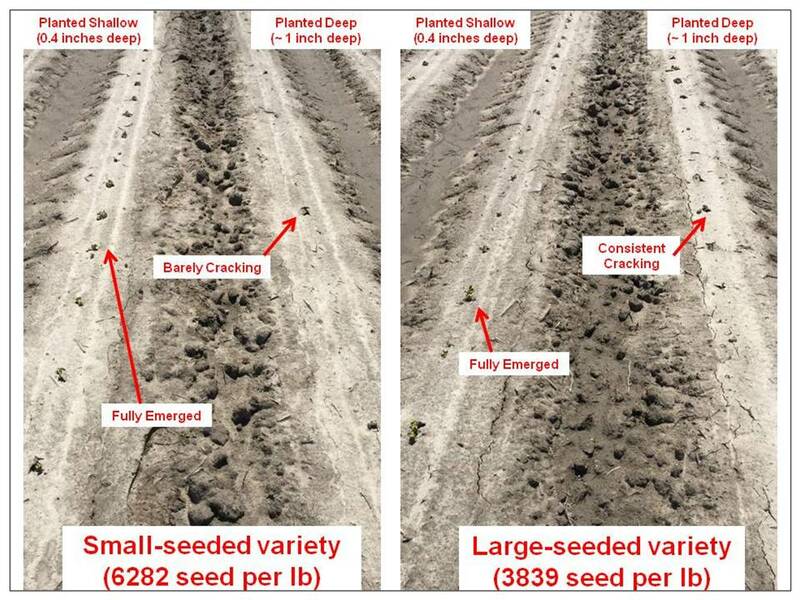 The effect of deep versus shallow planting for both large and small-seeded varieties where marginal emergence occurred. 4. Avoid using fertilizers in-furrow that could potentially damage germinating seed. Using starter fertilizers in a 2×2 placement is generally not a problem as long as rates and volume are within reason, and contact with seed is avoided. This is advised for all cotton regardless of planting conditions, but the risks of poor stands increases when planting conditions are not ideal. 5. Increase seeding rates 10 to 20 percent when planting in “adequate” or “marginal” conditions, depending on your current seeding rate. As a very general suggestion, if your current/normal seeding rate is rather low, consider increasing rates to 45,000 to 47,000 seed per acre. The weather forecast changes frequently, and Dr. Edmisten does an excellent job of releasing timely Planting Conditions reports based on these forecasts. Stay tuned to the NCSU Cotton Portal website for these and other reports.